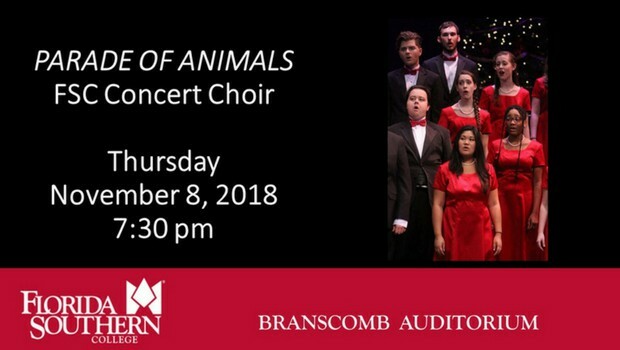 Dr. Beth Gibbs and FSC’s popular Concert Choir invite you to Branscomb Auditorium for an evening of delightfully expressive and innovative choral music, all on the subject of animals. You will hear everything from the humorous depiction of cows and fireflies by composer Eric Whitacre, to the tender “Un Cygne” (The Swan) by Paul Hindemith, with its rich harmonies and luscious tonality. Come join us for a whimsical evening of varied choral styles honoring the members of the animal kingdom. Thursday, November 8, 2018 – 7:30 p.m.